The UK company that built the test satellite for Europe's Galileo network is joining forces with a German firm to bid together to build more satellites. SSTL believes the link-up will drive down costs and speed up production by boosting competition among suppliers. 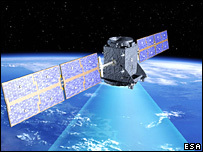 Europe's proposed rival to the US Global Positioning System (GPS) has been delayed by rows over funding. A compromise deal is expected to be announced at a meeting of transport ministers in Brussels on Thursday. It follows a recent agreement by EU members to use leftover portions of the farming budget and spare science and technology funds to cover a 4bn euros (£3bn) funding gap. The shortfall was created when a private consortium asked to build and operate Galileo collapsed. Under the new deal, the work will be split into six segments, enabling all countries to get a share of the construction work. Amid this backdrop, Surrey Satellite Technology Ltd (SSTL) is joining forces with OHB, based in Bremen, Germany. OHB has built several satellites for research purposes and is involved in human spaceflight and the Columbus space laboratory. "To date there's been no competition for operational Galileo satellites," said Phillip Davies, the business development manager at Guildford-based SSTL. "The announcement of the new team opens up the possibility of a real competition." The partnership believes it can produce Galileo spacecraft quickly and at an extremely competitive price. OHB would build the satellites; SSTL would produce the electronic payloads. The 30-strong constellation of Galileo satellites was conceived in the 1990s as an alternative to GPS, the technology that underpins car navigation systems and tracking devices. The proposed European system promises to improve the availability and precision of location and timing signals delivered from space. Designed to work alongside GPS, the enhanced programme is expected to drive many new applications, especially as new mobile phones come on to the market with sat-nav functionality. Galileo will have five services geared to different types of application or need. So far only a single test satellite - built and operated by SSTL - has been launched. Giove-A was lofted from Kazakhstan in December 2005. 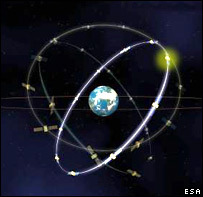 A contract for the first four satellites in the final constellation was placed with a consortium, known today as European Satellite Navigation Industries, in 2004. New contracts must be placed in the coming months for more spacecraft if Galileo is to maintain its present schedule of being operational by the end of 2012. A committee of British MPs recently called for the scheme to be curtailed unless there was a more convincing cost-benefit analysis; but SSTL has always maintained that once the system becomes even partially operational, the benefits will be obvious. It believes its partnership with OHB provides a solution to getting Galileo working quickly.